This type of appliance is Replacing Turntable Ladder & Rescue Tender. 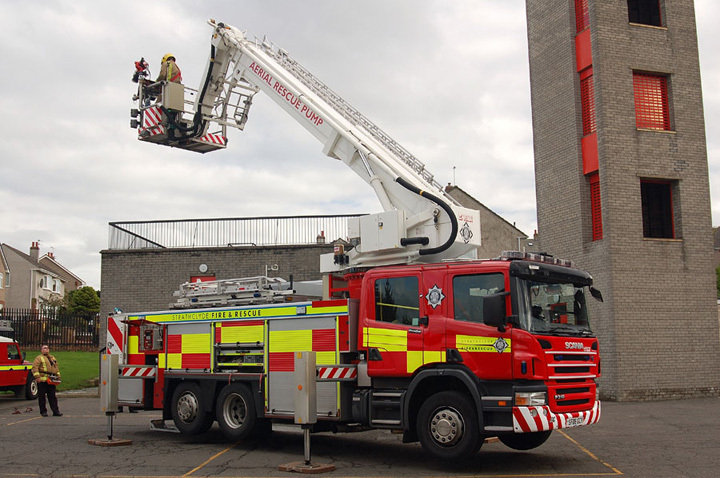 The Aerial Rescue Pump has all the equipment of a Water Tender Ladder & Enhanced Rescue Equipment and a 28 Metre Vema Rescue Ladder/Platform. Strathclyde now have 5 of them at various stations in Glasgow and plan to have 18 in total. picture #1457 and picture #1458 have the details; and along with picture #3188, have quite the discussions. Neat to see the Bucket out of its Locker, as shown in picture #1457. Are those ladders, on top of the body - if so, how do you get them down? Must be quite a bit of Compartment Stowage space lost, by putting The Bucket into its own locker. See picture #146 Margate Quint 24[2 axles]; and picture #98 Rahway Truck 10[3 axles] - for CARP designs on this side of The Pond. Added by Pat_R-B on 26 June 2008. Coatbridge fire station has one of these now. I think it looks cool but I cant see why the stratclyde would want to cut staff numbers by taking away the hydraulic platform. However Coatbridge sation's old H.P was very old. However, we need more firefighters not less. Added by ShaunyBhoy on 13 September 2008. Avon fire service have taken it's two arp out of service a 08 and a 10 plate the body work will be stripped down and the chassis reused for another special vehicle use. Added by Colin on 20 December 2016. Added by Ted Werrell on 20 December 2016.